A newcomer to the Dark Brotherhood, and known to be a bit too talkative, Antoinetta lives a rather anonymous existence in the Sanctuary. She sleeps in the Living Quarters every night between midnight and 6am and spends the entire morning strolling restlessly around the Sanctuary Hall. At noon she enjoys a four-hour meal in the Living Quarters, then heads for the Training Room where she spends an hour on the bench before her training starts at 5pm. She spends the entire evening in sneak mode, tirelessly hacking away on the training dummy until she returns to her bed at midnight. When you first meet her, her glowing personality will be quite noticeable. When she sees you she will say: "I've heard so much about you. Welcome to our family!" and continue with: "Welcome, brother. So good to finally meet you. I hope you're getting along all right." Surprisingly, she will treat female characters even friendlier: "Welcome, dear Sister! So good to finally meet you! I hope you're getting along all right. If you need anything, anything at all, you need only ask." She is also very candid about her adoration of Lucien Lachance, as she tells you if you inquire about him: "I will always think of Lucien Lachance as my savior. When he found me, I was living in a gutter, an inch away from death. I owe him everything." She will also give you her take on the mysterious Night Mother: "I've always wondered who the Night Mother really is. Some say she's an old woman who lives somewhere here in Cyrodiil, but I'm not so sure." When asked about the Sanctuary she will ask: "Have you ever lived on the streets, struggled to survive? This Sanctuary is my home. Here I have the safety and love I've searched for all my life." 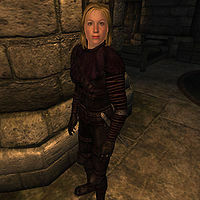 She will also explain her relationship with Sithis: "Sometimes, right before a kill, Sithis speaks to me. He whispers in my ear and fills my heart with the joy of suffering and death!" She also aspires that one day she may be able to take over Ocheeva's role, even though she is one of the newest members of the Sanctuary. When asked about rumors she will reveal: "Don't tell anyone else, but some day I'm going to have Ocheeva's position. Just you wait and see. Lucien Lachance knows real talent when he sees it." Esta página foi modificada pela última vez à(s) 13h31min de 2 de setembro de 2013.